These Vintage Doily Pumpkins from Mitzi Curi are the perfect way to decorate for the fall. Decoupaged with vintage lace doilies in various colors, this no carve pumpkin decorating idea is great for weddings, Thanksgiving, and even Halloween. You can use some black lace to add a more festive Halloween touch, or dye crocheted doilies various fall colors for a Thanksgiving centerpiece that's sure to impress all your guests. 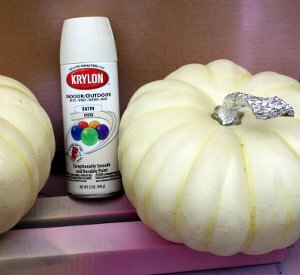 The only prep work I did prior to painting was covering the gourd stems with tin foil. I decided to give this one a try this season, since all the stores have fall merchandise fully stocked- I got in the mood for making something my own self! 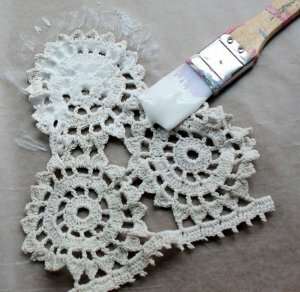 Although vintage doilies probably are the finest choice, go ahead buy those doilies from the Dollar Tree for a quick shortcut. The black ones look really cool. Mix black and pink and white for a kind of sugar skull look. 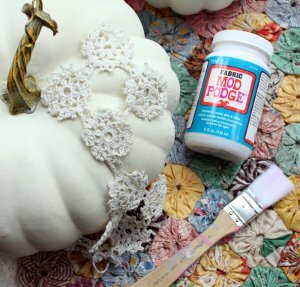 I have a great spin on these vintage doily pumpkins or gourds... while I absolutely am loving the Mod Podge to adhere the actual doily to the gourd, how about taking that doily and coating one side of it with a paint color of your choice- use one of those foam paint brushes- and then carefully place and pat the doily onto the surface, being careful not to smudge. 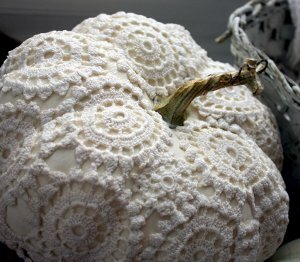 I say, paint the gourd/pumpkin in a pretty off white and coat the doily in black or in a blush pink!